The trip on the Hiram Bingham train to Machu Picchu is considered to be one of the best luxury train travel in the world . It begins in Poroy village located in the department of Cusco, towards the lost city of the Incas Machu Picchu. The train route will show you some of the most beautiful landscapes of this tour. What is the Hiram Bingham? 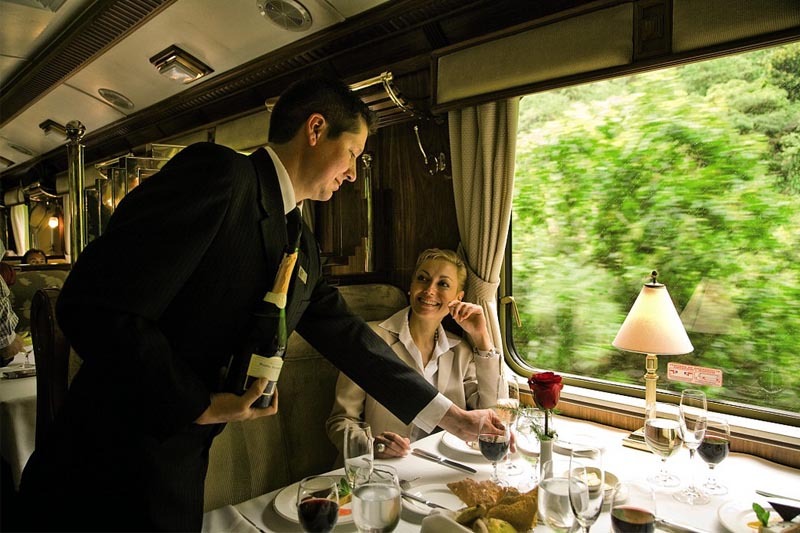 The Belmond Hiram Bingham is a luxurious and exclusive train with all-inclusive service, where you will experience unforgettable experiences. It is the finest way to travel to Machu Picchu – one of the main destinations in Peru and the world. It is an exclusive trip that goes from the village of Poroy (to the outskirts of Cusco) to Aguas Calientes. In it you will find the best of Peruvian hospitality. With good food, first class service and live entertainment on board. Where does Hiram Bingham come from? In the rainy season the luxurious train departs from Urubamba in the Sacred Valley of the Incas; Travelers are transported in private vehicles from the Wanchaq train station in Cusco, to Urubamba. To avoid unforeseen delays because train tracks are often affected by adverse weather conditions. How is the Hiram Bingham? The Hiram Bingham train, are blue exclusive cars and decorated with golden lines; Consists of up to 4 cars, two dining cars, an observation car / bar and a car kitchen. It is often thought that a train of this kind uses a classic steam engine. However Orient Express has opted for a more modern and reliable diesel engine. The Hiram Bingham can easily accommodate up to 84 passengers. How is the experience at Hiram Bingham? The experience starts at the train station. Passengers are greeted with sparkling wine and orange juice, small canapés, and a show of dance and traditional Andean music. When you are already on board, the maitre’d places the guests at tables elegantly decorated to be attended by the waiters. The tables in the Hiram Bingham are large, fixed to the seat and can eat in them for 2 to 4 people. After this the passengers are invited to explore the rest of the train. How is the food on board? A three-course brunch is served on the way, and a gourmet dinner is served on the return trip. The menu offers dishes made with fresh ingredients brought from the Sacred Valley. The dishes on board the Hiram Bingham are simple but elegant. This is to give travelers a clear idea of the country they are visiting; Native ingredients such as aguaymanto, quinoa and sacha tomate are used. In addition, to ensure only the highest quality of food, chefs cook and finish all the dishes on board the train, including baking bread; Beverages such as soft drinks, coffee and tea, local beers and wines, are included at no cost in the price of the ticket. How is the observation car on the Hiram Bingham train? To further enhance the 3 hours and 20 minutes from Poroy to Aguas Calientes, the Hiram Bingham has exclusive crew of on-board guides, highly experienced and exclusive professionals for the Hiram Bingham train, who know each and every detail of the route. An important part of the experience aboard the Hiram Bingham. It is the talented duo of musicians who with guitar and a traditional drawer entertain guests with a selection of melodies. The trip takes place with a music show in a relaxed and traditional atmosphere; Nevertheless in the return the duo usually intensifies the rhythm with songs of classic rock, of artists like The Rolling Stones, The Beatles or Latin rock of the Mexican band Maná. The Hiram Bingham train ticket also includes afternoon tea at the Sanctuary Lodge Hotel in Machu Picchu. Chosen “Best Train of the World” by readers of Condé Nast Traveler UK (2011). Mentioned among the 7 best trains of the world (Magazine Condé Nast Traveler 2010).